Does Medical Acceleration Improve Outcomes in Ulcerative Colitis Patients Who Are in Clinical Remission but Have Endoscopic Inflammation? 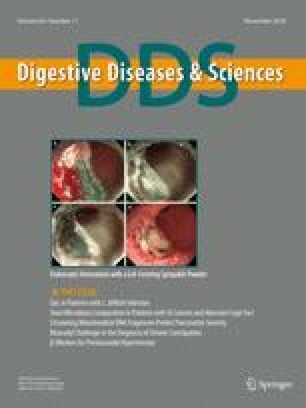 Discrepancies between clinical symptoms and mucosal inflammation have been reported in up to 50% of patients with ulcerative colitis (UC). However, there are no guidelines and only limited information for appropriate treatment manipulation. We aimed to evaluate long-term outcomes according to treatment strategies and determine predictive factors for disease relapse in UC patients who are in clinical remission (CR) but still have endoscopic inflammation. The mean patient age was 43.5 years, and 53.9% were male. The mean disease duration was 89.9 months. During a mean follow-up of 34 months, 90 patients (44%) experienced disease relapse. The cumulative relapse-free rate did not differ by treatment strategy (maintenance of current therapy vs. dose elevation or step-up therapy). Multivariate analysis revealed that left-side colitis or pancolitis at diagnosis (OR 2.10; 95% CI 1.04–4.27; P = 0.040) and number of extraintestinal manifestations ≥ 2 (OR 5.62; 95% CI 1.10–28.68; P = 0.038) were independent predictive factors for disease relapse. The current medical acceleration treatment strategy did not have a significant influence on the long-term outcomes of UC patients in CR but with active mucosal inflammation. Disease extent at diagnosis and extraintestinal manifestations were independently predictive of disease relapse. The online version of this article ( https://doi.org/10.1007/s10620-018-5193-2) contains supplementary material, which is available to authorized users.